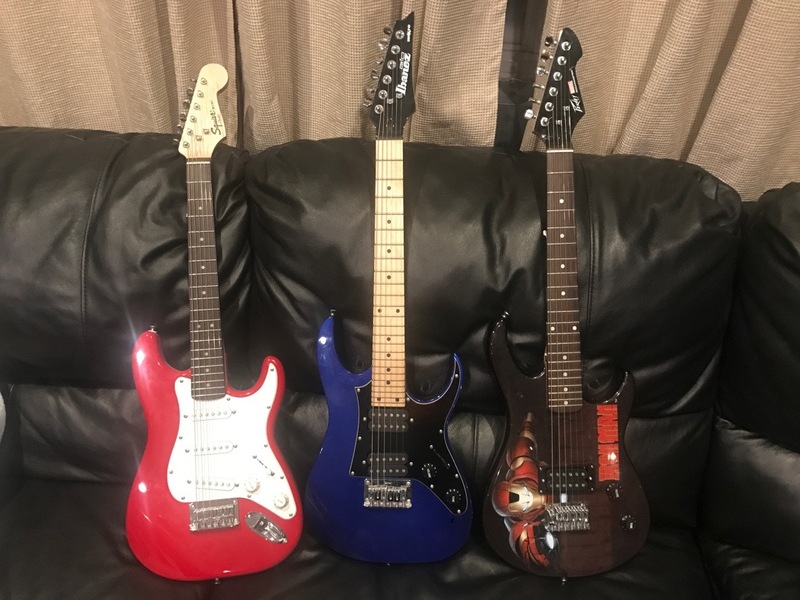 Squier Mini, Ibanez Mikro, and Peavey Rockmaster pictured from left to right. If you’re searching for a guitar for child just starting out, regular guitars are just too big. They’re too heavy, the necks are too thick, and most importantly, they’re TOO LONG. That’s where the 3/4 size guitars come in. They resolve all the problems that kids have with the normal sized guitars while still sounding great. My sons have played all three of these a bunch, and through watching them and using them myself, I can finally put together an extensive review here. This review covers about a 3 year use case, so it’s definitely not like I picked them up yesterday and am now writing a review, we’ve had these things for a while. We were using them almost exclusively with Rocksmith 2014, if you haven’t heard of that I recommend you check it out as it’s an awesome way to learn. This is definitely the most popular choice of the three mainly because its brand is so much stronger than the other two. If you see a 3/4 size guitar at a store, it’s likely to be this one. One of the good things about it is that it comes in a variety of colors, from pink to blue to black. We’ve got a the red one, it’s really nice looking in person. This was the first of the three that we bought. My son became interested in Rocksmith about 3 or 4 years ago and I bought this guitar for him to start with. He played this thing for over 100 hours without any issues, and in fact still looks brand new. It worked really well with the game as well, registering tones very well. Probably the biggest downside of the guitar is that it doesn’t sound particularly good when compared to a full size guitar. 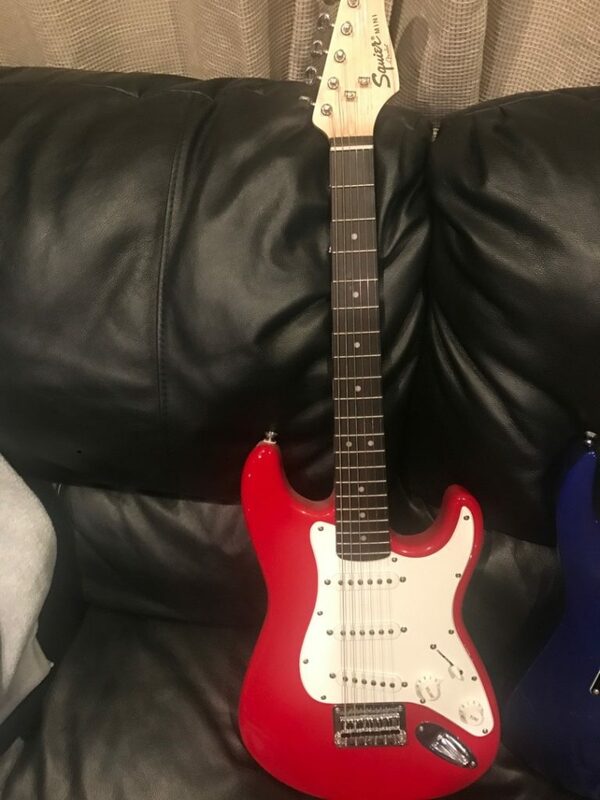 The rest of the construction is on par with a full size guitar of similar price. The Ibanez Mikro is kind of like the darkhorse of the 3/4 electric guitar scene. Not nearly as popular as Fender, the Ibanez Mikro makes up for that with a higher build quality and better sound overall. I got the Ibanez about 2 years ago when looking into getting a 3/4 Bass (check out the Ibanez Mikro Bass if you’re interested in that at all, it’s a good mini bass). Based upon the reviews I had read, they said it was a higher quality version of the mini Squier. After my son and I have used it over the past couple years, I think I would agree with that sentiment. In general, it’s a better sounding guitar with more frets too (24 vs 21). The design is slightly more edgier as well, looking more grown up than the mini Squier which looks kind of like a toy sometimes with the bright colors. Honestly though, both of them are very close in performance, I don’t think you could go wrong with either of them. I can’t say the same for the Peavy though. The Peavey Rockmaster is series of guitars themed for kids, with guitars featuring Iron Man and Captain America. That in itself gives them a huge appeal for kids wanting to play, my youngest loved that his guitar had Iron Man on it. The actual quality of the guitar though left a lot to be desired. When I first got the guitar, out of the box it was a mess. All the strings were broke or unusable, and the neck was bowed so badly that it was unplayable. It took some severe truss rod neck adjustment in order to get it playable. After I got it adjusted and added new strings, it became somewhat playable. It’s not the worst guitar, but it’s well below the Squier or Mikro in terms of quality. However, my son will not part with it, to him he’d rather have Iron Man on his guitar than play one that’s of better quality. He’s only 9 though, and I think as he gets older he may change his mind. 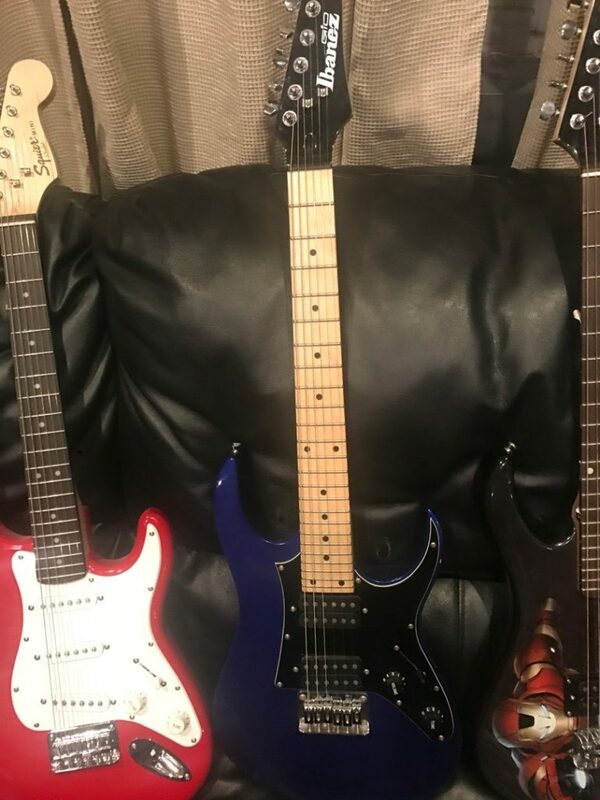 Probably the best way to describe the difference is that the Peavey Rockmaster feels like a toy while the Squier Mini and Ibanez Mikro feel like real guitars. I wish the quality was better so I could give it a good recommendation, but I would steer clear of it if at all possible. It’s just not on the same level as the other two. Out of the three, the Ibanez Mikro is the one I’d recommend the most for kids. It’s just a better quality instrument than the other two, and since their prices are so similar you might as well go for the better one. Second place would go to the Fender Squier Mini Stratocaster. It’s the most popular version and isn’t a bad choice by any means. 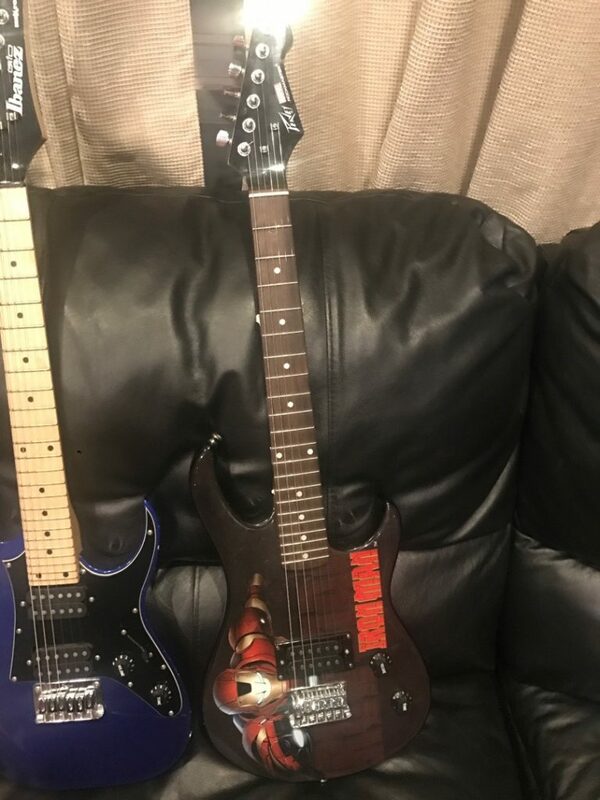 It comes in a lot more styles and colors than the Ibanez, so if your son or daughter likes the look of it more than the Ibanez, it’s not a bad choice to go with it instead. In a distant third place I’d put the Peavey Rockmaster. It’s just not a good enough guitar compared to the other two to recommend. I probably would have returned it if I wouldn’t have gotten it for my son as a gift. He just loves it too much in spite of the flaws. Hopefully this article has helped you decide which mini guitar to start your child on. I know I had a lot of questions when I started out, wish there would have been an article like this to give it to me straight (which is why I wrote this). If you have any questions or comments, please let me know.